It so happened that the morning I wake up with a sore throat and stuffy nose is the same day we go visit the Blackfeet “medicine woman” in Browning. But more about that later. 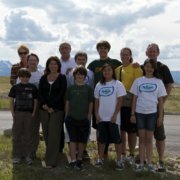 I slowly got out of bed, falling a few steps behind the rest of the Blackfeet Reservation volunteer team. Lucky for me, the pool manager slept in too, so I wasn’t the only one in town having a hard time starting the day! Even though I was the last one to eat and the last one out the door, I made it in time for my interview with the founders of United Native Nations Organization. Since it was a nice day, we met at the picnic area near the museum. Very interesting non-profit they’re starting up to encourage unity of all Native American tribes, and to fight for their rights and respect. After the interview, I went to work in my “office”, which is my car, parked outside the city library where I can use their internet. I met a nice couple from Wisconsin and so we sat outside the library, with our windows rolled down, computers on laps, chatting and working away. At lunch time, I noticed how busy Browning was. Every enrolled Blackfeet individual (including children) received their per capita payout of $550. Cars were backed up near the Tribal Offices, bank and grocery stores. Lines were stretched throu ghout town; people waiting to cash their checks. I finally ate and then went to the Glacier Reporter to submit my work. 4-year-old Ethan (grandson of a woman I work with) was there. So after some quick editing tips from Editor John McGill I was off in the backyard, ironically play-shooting at Ethan with his toy gun while he “shot” at me with a bow and arrow. Meanwhile, others of our Global Volunteers Blackfeet Reservation team were spread throughout Browning. Terri and Danny were making signs for Head Start offices. Andy and Brian were building and planting gardens for locals around the community. Marisa was off doing meals-on-wheels. The group and I went to Pauline Matt’s house to learn about her medicinal products – Real People Herbals – and how she picks and uses native plants for healing. Today, she prepared a batch of deep healing skin salve after two years of gathering, drying, extracting and blending plants. She said that whenever you have a real natural respect for Mother Earth, you’ll never have to worry, because the plants will guide you. She said searching for healing plants has led her on many journeys, and that natural medicine is important to everyone, not just the Blackfeet. It’s not just about preserving tradition, she explained to the team, but also about saving species that could be used for new drugs in western medicine or natural remedies for herbal practitioners. 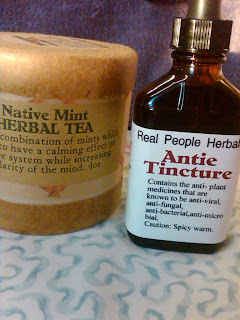 Pauline sent me home with some of her homemade medicine and hand-picked tea. She told me it will cure me of my cold and that I may “say a few bad words” after taking the medicine. So far, I can say that one of those statements is true. After we purchased our goods, we played with her dogs, and took pictures of her beautiful Blackfeet Reservation backyard – the Rocky Mountains.